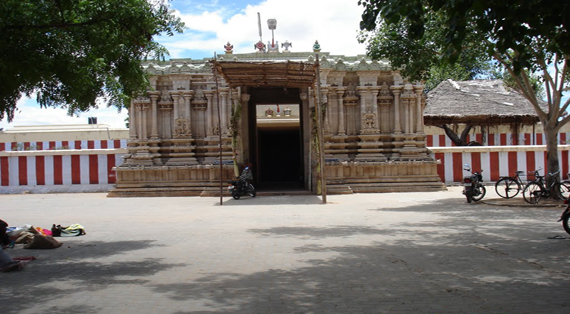 Sri Vaithamanidhi Permual Temple is one of the Nava Tirupathi -nine Hindu temples dedicated to Lord Vishnulocated in Tiruchendur-Tirunelveli route, Tamil Nadu, India in the banks of Thamiraparani river. All these 9 temples are classified as "Divya Desams", the 108 temples of Vishnu revered by the 12 poet saints, or Alwars. One of the Brahmaputiran, who came out of Lord Brahma's ears - named Pulathiya Rishi and Kasthamal's daughter Aavirpoo gave birth a child named Visiravasi. The child who born for this Visiravasi and Ilipillai is Kuberan.Kuberan did tapas praying Lord Shiva. When Shiva and Parvathi gave their seva to Kuberan, since he could not see the bright shine came out from Parasakthi, Kuberan lost his eyes. After this, he replaced an eye made of gold and ruled Alagapuri and became one of the friends of Lord Shiva. Vaisyantham which is said as always move from one place to another in search of money and other things and this kind of persons one called "Vaisyaas".Guberan is said to be one of Vaisyaas and his wife is chitiregai and his Vaaganams (vehicles) are Horse, Parrot. 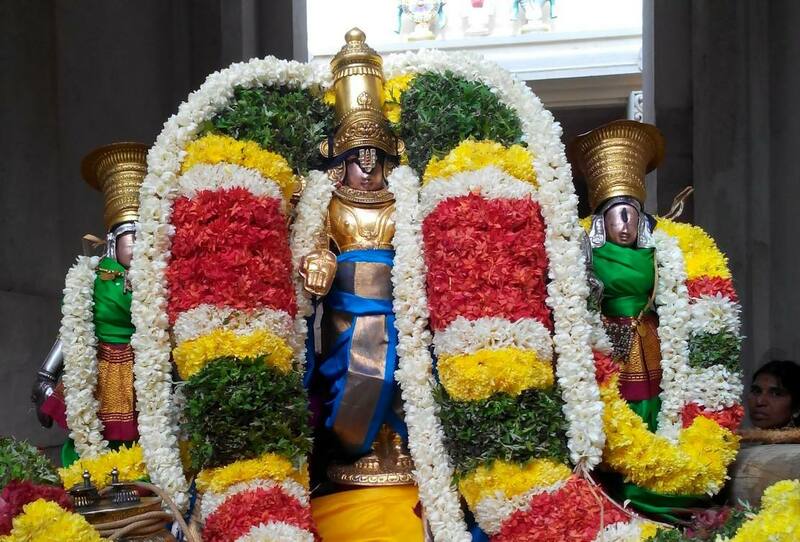 His weapon is Katkam and Garland is Seerakka Maalai. His park is Saithiratham and the Vimaanam is Pushpaka Vimaanam. His son is Nalakooparan.Once he got the Sapan from Parvathi Devi and lost all of his wealth (Navanidhi) and started to worship this sthala perumal as his Emperumaan. This sthalam is also called as "Adharma Pisunam". It means Dharman wars agians the Evil (Adharmam) and it permanently stayed in this sthalam by riding out the adharmam. Vaithamanidhi perumal stands still here in this sthalam to ride of the Adharmam to protect the wealth which cannot be taken out. This perumal has thirusangu in the left hand and in the right hand he has thiru Chakkaram by which he destroy the Adharma. In this sthalam only, Madhurakavi alwar was born, Who then because the sishya (student) of Nammalwar. Madhurakavi Alwar is said to be the Gnana Nidhi.This sthala perumal gave prathyaksha for Kuberan, who is the wealth, Madhurakavi Alwar, who is the Gnana nidhi. Due to a curse by Mother Parvathi, Kubera lost all his wealth. The Nava Nidhis 9 kinds of wealth left him and they came to Lord Narayana Perumal. 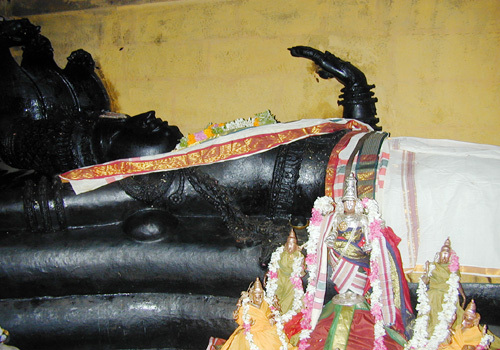 As Perumal was the custodian of the wealth (nidhi), He came to praised and named Vaitha Manidhi Perumal. He is granting darshan to devotees keeping these Nidhis under His right shoulder. Kubera worshipped this Perumal and got back the Nidhis, according to scriptures. Perumal is also known as Adharmapisunam. The temple is open from 6.00 a.m. to 12.00 a.m. and from 1.00 p.m. to 7.00 p.m.Vaikunda Ekadasi in December-January is grandly celebrated in the temple. Vimanam : Sri Hara Vimaanam. Thiru kannamangai Sri Bhaktavatsala Temple,Tanjore..
Thirumohoor Kalamegaperumal Temple , Madurai, Tami..